Cannabis, also known as Marijuana, Ganja or Pot has been grown and used by human race since a long time ago roughly 500 BC. An origin of this herb comes from India from where it spread to Europe, Africa, and Americas in the end of course. While the ancient societies already knew about the medical and psychoactive effects, due to a speed and simplicity of cultivation, the western countries used the plant for production of paper, fiber, textiles, ropes and other similar products. The authorities in several American states actually required farmers to grow cannabis during the 17th century. Later in 19th-century people learned more about the herb’s uses and its popularity accelerated across Europe and America until it was prohibited. Consequently, it was officially declared illegal and classified as a Schedule 1 drug together with LSD, Ecstasy, and Heroin. These days the situation is slowly changing – several developed western countries already legalized medical marijuana and a small number of them legalized even recreational cannabis. While you might hear recently about California and Nevada, this article is going to focus on Canada. Canadian prime minister Justin Trudeau introduced legislation for a legalization of recreational marijuana by summer 2018. This would result not only in the rise of profits for producers but also as tax revenue for provinces and government. At the moment the split deal is 50 – 50 share, the new deal should give 75% of tax for provinces and 25% for government. Whether this introduction is going to become a law is quite likely based on the surveys. The progressives currently control a majority of government, while conservatives do not pose sufficient power to halt or slow this down. Medical Marijuana is a plant whose extracts and ingredients are used for the treatment of several diseases, for instance, multiple sclerosis, dystonia, Parkinson, epileptic seizures or post-traumatic disorders. Cannabis plant contains two crucial ingredients: Cannabidiol (CBD) and Tetrahydrocannabinol (THC). For medical marijuana, it is the CBD that brings all the healing power, while THC poses its psychoactive effect that is more desired in recreational marijuana. The experienced producers are able to balance the levels of CBD and THC for each type of cannabis so the end user is given the correct final product. The application can be done in several ways, although the most popular and the least recommended is smoking, there are other possibilities such as vaporization, inhalation, oral application in form of food and topical application in form of oils or creams. While the medical cannabis has been already legal for some time, the industry is still in its very young age accounting for 6 billion dollars in 2017 and based on the recent research the sales growth is supposed to quadruple within next 4 years. The recreational cannabis industry is expected to be even bigger. At the moment it’s rather in hands of illegal producers, however, if the legalization happens this summer, the current medical marijuana producers are ready to enter with products of desired levels of THC. North America has established a marijuana index, where American and Canadian companies are listed. When looking at Canadian index, it is more than obvious that something is going on. The price of the index has moved to new levels suggesting a significant interest in the industry. Constellation Brands, Inc. bought 9.9% of Canopy Growth Corporation which is the biggest marijuana company in the world. This was the first intervention by alcohol selling firm into cannabis industry of such scale yet, which triggered a buying fever in this legally new business. As already mentioned earlier, Canadian prime minister Justin Trudeau wants to legalize marijuana also for recreational users, which is going to result in the waves of higher sales figures. As the heat evaporated, the index started to correct and now it seems it is finding its consolidation levels. Canadian cannabis industry is at the moment dominated by few large companies that have a significant impact on the index movements due to their big market capitalization. 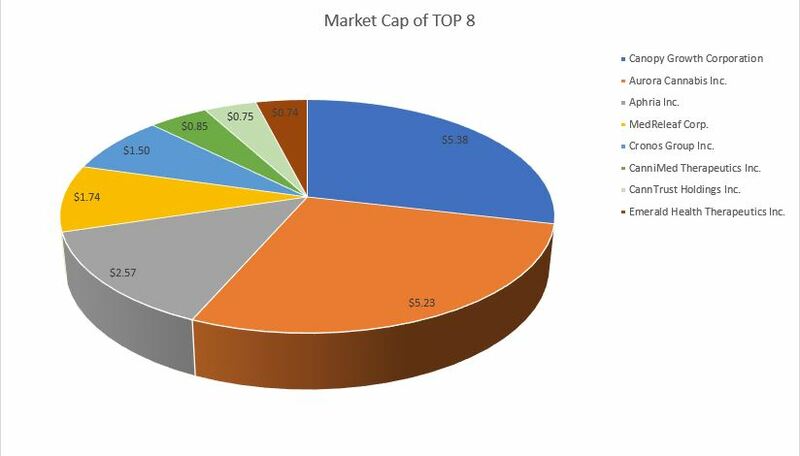 Out of 89 securities registered on Canada’s stock exchanges ( CSE, TSXV, TSX; no OTC or US exchanges included ), there are 8 companies over $700 million market cap. Although Canadian market has its monopolies, there are few investment strategies that might work just fine. Several analysts have been challenging a topic of a supply shortage. Although this question is rather overdone, if that is the case, there are 93 companies engaged in Cultivation and Retail who will be ready distribute and thus, their sales figures will gladly race with each other. For instance, plotting the share prices of the mentioned eight companies, even though it’s well correlated, the smallest by market cap – Emerald Health Therapeutics (EMH.V) experienced the largest price rise during the recent buying flutter. There are a lot of small companies who enter the market constantly and many of them have been acquired by the large players as Canopy Growth or Aurora Cannabis. Once the law of legislation passes through, the acquisition spree will most probably only begin as it has been a case in the technology sector with small tech firms acquired by IBM, Google or Apple. The number of licenses granted by Health Canada is growing, at the moment 80 licensed producers are allowed in Canada while hundreds have registered. The increasing interest in the legalization of medical marijuana around the world is only pouring more gasoline into a fire of Canada’s supply chain since more and more countries are opening doors for imports. Furthermore, the licensed producers are already engaging in the improvements of their international businesses by building greenhouses, buying processing facilities or acquiring local firms across Europe, Israel or Australia. An interesting market is opening in Germany, a country with a population of 82 million, has national health scheme that covers treatment using medical cannabis. This has a potential twice bigger than a market in Canada. Currently, this industry is still young and of course, brings a risk to the investors. It is important to watch the trend and wait for the right time to enter the market cycle. At the moment, the index is recovering from recent buying fever and its price is searching the consolidation zone. 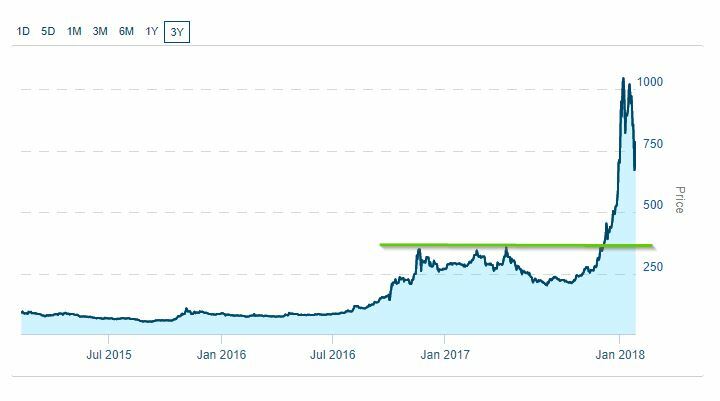 The legalization of recreational cannabis is going to be the major catalyst, so summer 2018 will definitely be a delightful period for cannabis investors. Generally, there is an increasing interest for cannabis among the public, so it is just matter of time when it is going to be sold as legally as possible not only abroad but also in the USA and for investors it will be just matter of how they play the trend of this particular market.